Juan Conde is fighting to keep his dream alive. 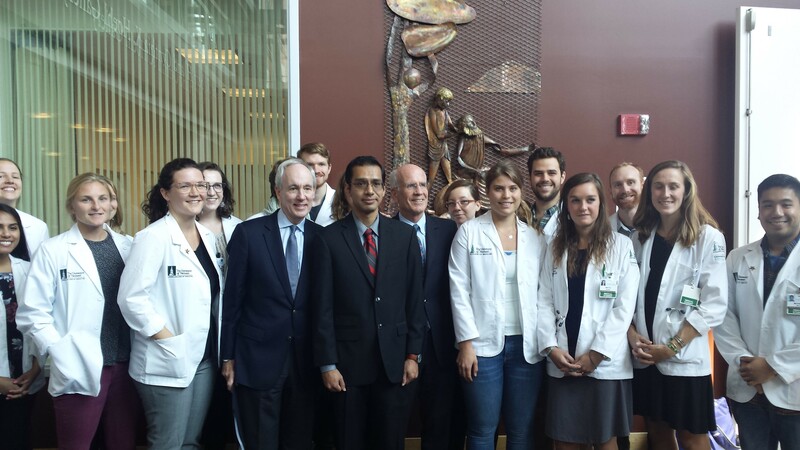 Flanked by University of Vermont president Tom Sullivan, Congressman Peter Welch (D-Vt.) and fellow students at the University of Vermont Larner College of Medicine, Conde on Monday spoke at a press conference about his experience as an undocumented immigrant. Conde is among the 800,000 people whose lives have been thrown into turmoil after President Donald Trump last week rescinded the Deferred Action for Childhood Arrivals program. The directive gives Congress a six-month window to decide on the fate of the DACA recipients, who are commonly known as Dreamers. In a letter that Conde sent to Welch last week — and which has since been made public — the first-year med student urged the congressman and his colleagues to "come up with a legislative solution to this issue." Conde came to the U.S. from Mexico with his mother and brother when he was nine. His mother believed in the American dream, he said, and had heard stories about the "great nation" from her own father, who was a migrant worker in Texas. After his mother died of cancer in her 40s, Conde was motivated to find a cure for the disease. Although he wanted to become a physician, he had to settle for doing science research because his status as an undocumented student made it impossible for him to attend medical school, Conde said. But something "amazing" happened when president Barack Obama instituted DACA in 2012, Conde said. He was able to be paid for his research position, get a driver's license and apply to medical school. Today, the 31-year-old said he is chasing his dream by attending med school. Conde also has a PhD in biochemistry and molecular biology. Conde said he decided to speak up after Trump's announcement because he was tired of being afraid. "This is my home. The American people are my people," Conde said emphatically. Welch vowed to fight at the federal level: "I will do every single thing I can to make certain that at the end of the six-month period, Juan and his fellow 800,000 Dreamers have continued legal status." The congressman also made reference to a study by the Center for American Progress, which calculated that the U.S. gross domestic product would lose $400 billion over the next 10 years should DACA employees lose their work permits and jobs. "Why should America shoot itself in the foot? These folks are fantastic," Welch said. Sullivan said the end of the DACA program has presented the university with a "real legal and moral crisis." The institution takes students' privacy interests very seriously and does not disclose private information about students without appropriate legal measures, such as subpoenas or warrants, Sullivan said. "The university will continue to do all we can within all established legal precedence and parameters to provide a safe, protective and welcoming environment for all members of our community," he said. He declined to reveal the number of undocumented students at UVM. Making a public statement in support of undocumented students is a step in the right direction, said Sarah Childs, assistant director of UVM's Mosaic Center for Students of Color, who was also at the press conference. "I do think that stating publicly our support for students, and being very firm and direct about that, is very important," said Childs. But she hopes that more will be done to educate the campus community about the experiences of undocumented students. She said that the debate has largely been framed in terms of the DACA program's economic benefits. "We need to take care of the community members as human beings, not as cash cows. These are their lives we're talking about," Childs said.